Exclusively for Falmouth University students, Henry Scott Tuke House is the perfect student halls to enjoy all that Falmouth has to offer. Prices are available on the Falmouth University website. This room type has a single bed and private bathroom. Henry Scott Tuke House is located in the heart of Falmouth and is home to 156 students from Falmouth University. Our accommodation is split over 11 blocks with each flat containing five en-suite bedrooms. 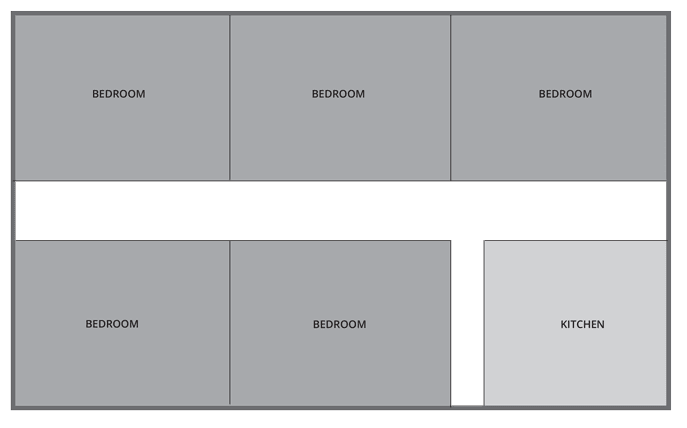 Each bedroom comes complete with a comfy single bed, a wardrobe and a fitted desk area. You’ll also have access to your own private bathroom with shower, basin and WC. The site is covered by 24-hour CCTV and each block can only be accessed by a fob with each flat and bedroom accessed with a key. Our on-site facilities also include a laundry, our dedicated repairs and maintenance service and a great team at reception who are available from 9am to 5pm, Monday to Friday. Our reception is covered by security officers outside of office hours. The historic city of Falmouth is right on the doorstep of Henry Scott Tuke House with an abundance of shops, bars and transport links within a few minutes’ walk of the halls. You can also take in the fresh sea air with the seafront less than a five minute walk away. Our superb location is also great to catch the regular transport to the university campus. This is a typical flat layout and actual apartments within this site may vary. Henry Scott Tuke House is surrounded by all the best shops, bars and restaurants that Falmouth has to offer. Local supermarkets including Iceland and Tesco are opposite the halls. There is a selection of bars and restaurants located outside the halls. The centre of Falmouth has a thriving high street with a mix of big brand and independent shops. Bus stops are outside the accommodation campus with regular buses to the universities Penryn Campus and Truro. Applications are dealt with by Falmouth University. Head over to their website to submit your application or call the university accommodation office on 01326 253639. The internet is provided in your bedroom through Ethernet Cable. Wi-Fi is also available throughout the building. You can collect your keys from the day your contract starts. On arrival, you can collect your keys from reception. For check in you will need to bring ID and a copy of your offer letter/email or payment receipt. An area to park and unload your belongings will be available. Because of limited parking space you will be asked to move any vehicle as soon as you have unloaded. Contact the Falmouth University Accommodation Office for the cancellation policy. Falmouth University offers information on student life in Falmouth. Contact Falmouth University to view a sample of your tenancy agreement. If you are bringing a TV to watch live TV, or if you receive or record live TV programmes on any other device, such as a laptop, you will need a TV Licence. You won’t be covered by your parents’ licence. Henry Scott Tuke House benefits from LaundryView which will make doing your laundry on-site even easier. The system, created by Circuit, allows you to go online and check the availability of washers and dryers in your building as well as see when other washes are about to end. Insurance is provided by through the University by Endsleigh. More information is available from the Endsleigh website.